I've enjoyed entering and visiting the Blogger's Quilt Festival over at Amy's Creative Side over several years. I've delayed sharing my most recent quilt finish for a few months, so the festival was a good excuse to get back to the blog and continue documenting my adventures in sewing. One of my first quilts I made with modern fabrics was "Circle Circus." I fell in love with one of the first modern boy fabric collections ever to arrive on the fabric scene: Urban Circus by Laurie Wisbrun. I honestly ended up buying and using 7.5 yards of that blue elephant print. (I was a new mom to a sweet baby boy and loved sewing for him.... who's now about to turn 8 years old!). Adhering to the mentality, "I love this fabric and if I don't buy it now, it will be unavailable when I am ready to use it;" I stocked up on the girl colors of the fabrics too, not necessarily convinced I'd someday have a daughter- I just loved the collection! 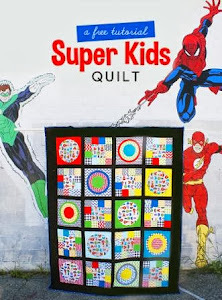 So several years later, I made the girl version of this quilt. 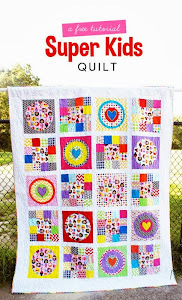 This quilt is made from such a simple pattern: circles on squares. I appliqued the circles using the Super Circles technique, aka the "tin foil method." I used tons of stash fabrics for this quilt, cutting a circle and square out of 47 different fabrics. I really like the scrappy look. I bravely decided to quilt this as my first quilt on my newly acquired longarm over the summer. Quilting it went pretty well overall, I had a decent degree of confidence in being able to quilt this quilt because I'd (essentially) already quilted it before. I simply started at the beginning of a row and swirled in and out of the circles along the row. For the backing, I used a big chunk of an older RK London Calling fabric as well as a bunch of orphan blocks from a baby quilt I'd made in 2011. That felt great to finally use those up! The quilt measures about 64x80. It's now one of many quilts in possession by my daughter but she's still graciously allowed me to use it now and then. During May and early June, I had a lot of sewing goals to accomplish. I am happy to say that I just wrapped up one of my biggest projects: making baby gifts for a niece. My brother Brian and his wife Ashley are expecting a little girl and I guess the plan is for Ashley to be induced this Thursday. They already have a little boy, just 2 weeks older than my youngest son. I knew they appreciated the baby gifts I made for their son, and I love to spoil babies in the family, so I went all out for their little girl. Long before Ashley was even pregnant with her daughter, I bought two Daysail charm packs to stash away for the possibility of her ever having a girl. She and Brian are obsessed with sailing and I knew I should grab some "feminine sailing" fabrics, as that is not a very common theme! I am so glad I did, making a bunch of "Daysail" projects was a lot of fun. Of course, I had to make a quilt. I used the Moda Bakeshop tutorial, Charming Stars, by Stefanie of Little Lady Patchwork. I made just 9 blocks, it was a very easy and enjoyable project. Initially, i was just going to do red solid stars in the middle of every block, but by adding pink and blue, I was able to use a lot more of the Daysail squares without anything blending in with surrounding fabrics too much. I sashed the blocks with a Cloud9 background fabric from my stash- I was *so* close to not having enough, but I managed to find some scraps of it, which helped me have just enough to make it work. I thought about sashing the blocks in white, but I just couldn't do it. I really don't like using too much white for a baby quilt! I finished this quilt while my parents were visiting last week. It was such a busy time, but I knew I wanted to get everything done in time for my mom to take the sewn gifts home (as they live about 45 minutes from Ashley and Brian). Stippling a quilt is the fastest way for me to quilt on my domestic machine, but I am so tired of doing that. I decided to try a decorative stitch and sew it along across my quilt. It's like waves, right? I used stash fabrics for the back and purchased a Bonnie and Camille basic stripe for the binding. I made a tiny Geranium dress, size 3-6 months, for the baby too. Isn't it just darling?! I happened to have these Daysail fabrics in my stash- but I wish I had first remembered that I had a whole half yard of the aqua sailboat fabric. Having a large stash can have some drawbacks! Eventually, I remembered that I had the aqua sailboat fabric and I went ahead and made some bibs and a diaper pouch. Here's all of the themed gifts together. Isn't it so fun?! It feels so good to have finished up all this stuff and I know it will be appreciated. It feels kind of weird to have lots of freedom on what to choose to sew next.... I will say that I have big news on a big change that is coming to my "sewing life." I'll share more soon!